Use a non-stick griddle over medium heat. In a mixing bowl, smashed the ripe banana with a fork. Mixed in all of the remaining ingredients and whisked until combined well. Spoon 1/4 cup of pancake batter at a time on to the hot griddle and cook for 2-3 minutes. 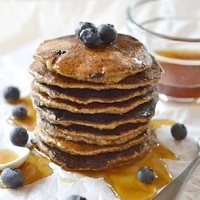 When the tops were beginning to bubble, add a few fresh blueberries to each pancake and flipped using a spatula. Flip and cook the pancakes for another 2 minutes then removed them from the pan with the spatula and placed them on a plate, blueberry side up, to cool slightly.